We live in one of the most highly tick infested areas of the country. Also, this past flea and tick season has been the longest and the worst that our clients have ever seen. Remember, it’s the fleas and ticks you don’t see causing all the skin and other problems. Once you actually see a flea, they have already been in your house laying thousands of invisible eggs for 6 months. The danger is that parasite infections can develop from flea and tick bites. 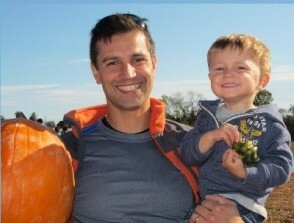 Unfortunately, the debilitating effects may not be seen until months and sometimes years later. Diseases such as Lyme, Anaplasmosis, Ehrlichiosis, and Rocky Mountain Spotted Fever are a few of the more serious tick-borne diseases that affect both pets and people. Keeping your pets on preventative medication year round is not only the best way to protect them from parasite infections, it also is the best way to protect your human family members. 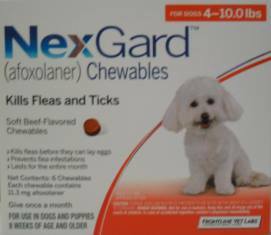 The exciting news is that protecting your canine friends just got a whole lot easier with a new, FDA approved chewable tablet made especially for dogs called NexGard. NexGard is made by Merial, the same makers of HeartGard and Frontline Plus. Those of you using Frontline Plus, Parastar or Vectra probably already know that these topicals don’t enter into your dog’s bloodstream. We feel that a monthly flea and tick preventative is so important that we sell Frontline Plus cheaper than Costco. Please note, Frontline Plus topical is safe and effective only if you don’t wash your dog 2-3 days before and after application. However, some of you might not enjoy the application process, and your dog might not like it either. Avoidance becomes an issue, and eventually your dog goes unprotected. That’s where NexGard can make a difference. 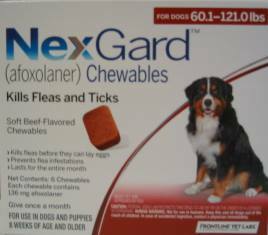 The beauty of NexGard is that dogs love the soft, beef flavored chew. 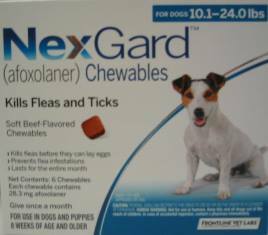 It kills fleas and ticks for an entire month using a novel ingredient afoxolaner proven to be safe and effective. NexGard is made for dogs only. Do not administer to your cat, as their systems are different, and this product will not work. If a cat accidentally eats a dose, it would not be harmful. 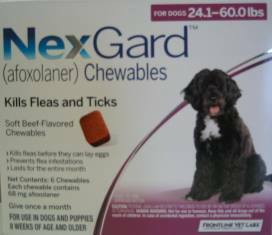 NexGard is so palatable, there is no need to administer NexGard with food. Dogs enjoy the flavor and will readily eat it alone. NexGard is a vegetable-base, meatless chew that uses beef flavoring. Studies have shown it will not trigger beef allergies in your dog. NexGard is not available in stores. It is sold only to veterinarians. Vets prescribe it and dogs love it! 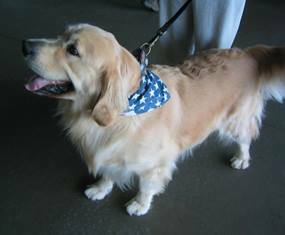 We will be happy to discuss with you personally the use of NexGard with your dog. Please call our office with any questions. This entry was posted in General Pets, News, Veterinary Medicine, Veterinary Services and tagged Canines, Dogs, Pet Health, Veterinary Medicine. Bookmark the permalink.